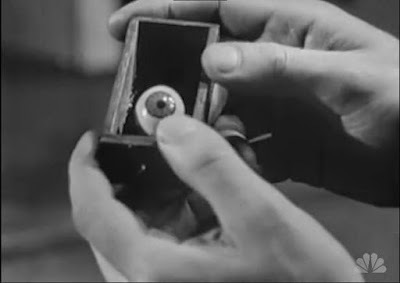 "The Glass Eye", which was the first episode of Season 3 of Alfred Hitchcock Presents, was one of the very best. It featured two of producer Alfred Hitchcock’s trademarks – suspense and the theme of mistaken identity. We always expect suspense from “The Master of Suspense”, but on this occasion, our concerned curiosity is heightened by the early introduction of a glass eye and what it may mean to the main character. In fact the entire story amounts to a suspenseful buildup to the dramatic climax that reveals the meaning of the glass eye. Although simple in its concept, the 25-minute show features excellent production values from all concerned. It is based on a story by John Keir Cross and was scripted by Stirling Silliphant, who would soon find even greater fame in connection with two popular television series that he created and for which he wrote most of the scripts – Naked City (1958-63) and Route 66 (1960-64). This episode’s director, Robert Stevens, won an Emmy Award  for this production. 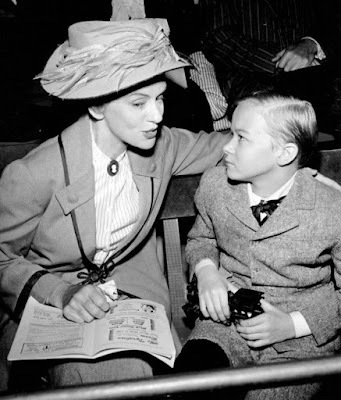 And, like many episodes in Alfred Hitchcock Presents, the drama is graced by a famous performer, in this case Jessica Tandy. Ms. Tandy had a long and distinguished career on the stage and screen. Perhaps her most famous role was her Tony-Award-winning performance as Blanche DuBois in the Broadway stage production of A Streetcar Named Desire (1947). But modern viewers may remember her more for her performance in Hitchcock’s The Birds (1963). In all her appearances, she evinced a level of heartfelt sensitivity that raised the emotive tone of the drama of which she was a part. The story begins with Jim and Dorothy Whitely going through the personal belongings that have been left to them by their elderly spinster cousin, Julia (played by Jessica Tandy), who has recently passed away. When they come across a glass eye that has been kept in a jewel box, Jim (William Shatner, famous for his role in the Star Trek TV series and films) begins explaining to Dorothy what was the special meaning of this glass eye, and the rest of the tale is told in flashback. Julia was an aging, single woman who worked in an office and lived alone in her apartment. One of her few social contacts was when her neighbor asked her to look after her young boy when she was busy. On one occasion she took the boy to see performances at a music hall, and she became enthralled with the comic act of a ventriloquist who would speak to his stuffed dummy. 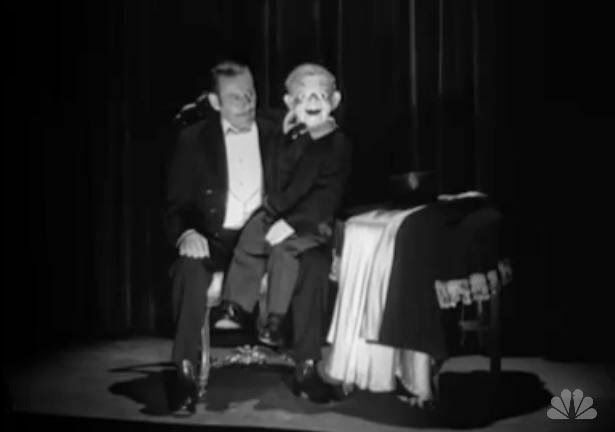 The ventriloquist, Max Collodi (Tim Conway), is always suave and debonair, while the dummy, George, is cast as an obstreperous, wise-cracking goofy young boy who constantly contradicts his master. Julia, who has presumably never had a romance, begins repeatedly going alone to more performances of Max Collodi, and the more she sees of the man, the more she is enraptured. When Collodi departs London to perform in other cities, Julia, increasingly in love, follows him in order to attend his shows. She writes letters to him, which mostly go unanswered, and she begs to get the chance to meet him. She sends him a picture of herself, but it is not a recent picture – she wants to present a younger and prettier image of herself in order to make a positive impression. Finally, the demure and reserved Collodi agrees to a meeting, but he will only allow a very brief visit. But Collodi’s evident loneliness and shyness only make him even more appealing to Julia. She feels that they are a perfect match. Finally, on the fateful evening of the arranged meeting, Julia arrives at Collodi’s apartment and sees Max seated at a table with George sitting next to him. What happens next is the dramatic denouement to which all the suspenseful buildup has pointed. For the benefit of first-time viewers, I will leave it to you to watch it and see what happens. All I can say is that the mistaken identities and the mystery of the glass eye are revealed – both to Julia and the viewer – in traumatic fashion. The climax is stunning and makes it all worthwhile. the International Academy of Television Arts and Sciences (IATAS).